Other Ingredients:hydroxypropyl methylcellulose (vegetable cellulose capsules), cellulose powder, vegetable source magnesium stearate, titanium dioxide. Recommendations:2 capsules daily. Studies suggest that, for better bioavailability, strontium should be taken more than two hours before or two hours after taking a calcium supplement. Strontium is absorbed using calcium transport mechanisms, and should not be taken at the same time as calcium supplements. Strontium is very safe and non-toxic. This product contains strontium citrate, not strontium 90, the toxic radioactive form that may come to mind. Strontium citrate has been a safely used substance for over 100 years, and there have been studies using 2 grams of strontium with no significant side effects. In fact, there are several forms of strontium in use today. However, strontium citrate is the most easily absorbed and used by the body. However, strontium supplementation may be contraindicated for individuals with impaired renal function. Please consult your healthcare practitioner if this is a concern. 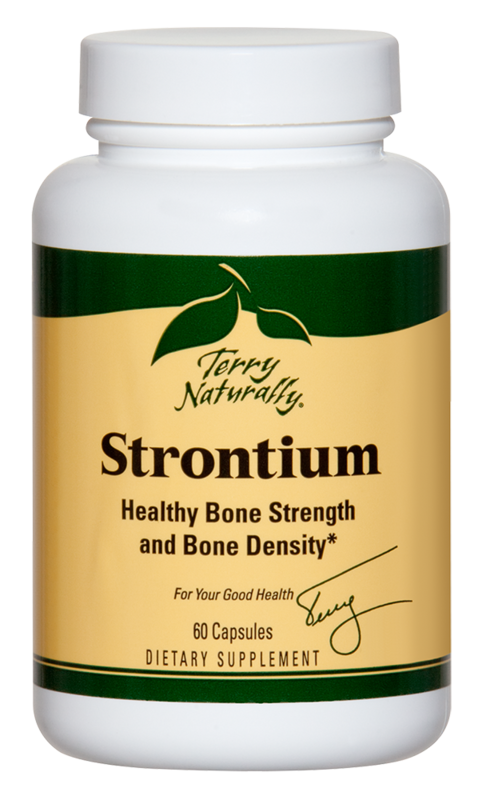 If strontium is good for healthy bones, why isn’t it in OsteoStrong™? Because strontium and calcium (one of the primary ingredients in OsteoStrong, and the major mineral in bones) compete for the same absorption pathway in the body. That’s why we recommend that you take Strontium at least two hours away from OsteoStrong or any calcium-containing supplement.